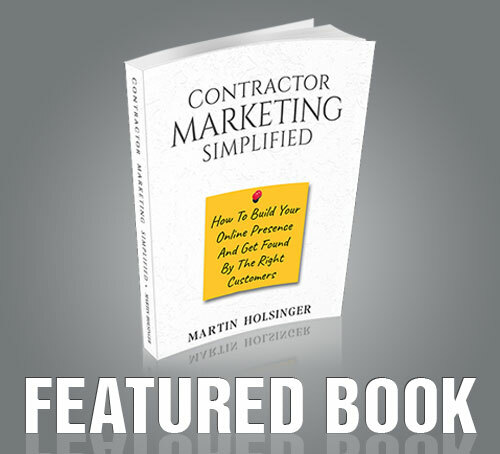 I didn’t listen to him–I became a contractor. Contracting is a multi-faceted job. You will be a Marketing Manager, Salesman, Project Manager, Tradesman, Teacher, Errand Boy, Bookkeeper, Accountant, CEO, Controller and Business Strategist all in one. Like any startup, you are jumping off a cliff and assembling your aircraft on the way down. You are trying to build a business before you run out of money. You need profit to outsource the things that you are not good at as quickly as possible. Why do you need plentiful leads? Why do you need the “Right Leads”? In order to maintain a large profit margin, you must choose which jobs to take and which to decline. The more high quality leads you to have, the easier it is to maintain profit margins. Sales are where profit is made to grow your business. In the coming weeks, I will try to share a few actionable ideas to get you finding and closing more leads. You don’t need a website to take advantage of this free listing. Add lots of photos and have your customers give you reviews and attach their own photos. This is like a free website. I think I have listened to nearly every episode of the “Protractor Podcast”, and most builders will admit that Craigslist and “Kijiji-“(Canadian Version), is where most builders start out. I just shake my head when I hear it. Craigslist has the lowest quality and most price-conscious prospects you will find. Nearly every potential client you find there is fishing for the lowest price sees what we do as a commodity and is willing to risk their hard earned money to prove they are right. You will work harder for less potential profit servicing these leads. Craigslist is a cop-out. It can work fine for a handyman filling in $200 jobs on the weekend while he works a regular job, but for professionals, it’s a crazy place to be marketing. Hack: To sift through these leads quickly, charge something for the quote–Anything. Fishermen will not pay to have someone come out, but someone that can’t get anyone to look at the job will pay and will pay a premium to get the job done. Google is discounting directory sites heavily since they are competition to Google. Though they may rank presently, watch for them to see their ranks decrease as time goes on. Directory sites are also easy to game. Fake reviews are rampant and obvious. Keep in mind that sites like Angie’s List and Home Advisors sell their leads to multiple contractors thus keeping it all about price. Competing for bids is not where you want to be for profit. Hack: Spend a few dollars with a marketing expert to create good ad copy. Stick with the cheap or no-cost options and connect them to your website. The incoming links still count towards helping your website rank. Also, you can have friends and family create reviews for you– your competition already is. Facebook may just turn out to be a rich stream to pan golden leads. It is inexpensive and you can direct your ads to demographics you choose. When customers respond to your ad, you may find no competitive quotes. Instagram is a good way to qualify yourself as a professional and if you are primarily subcontracting, can be instrumental in connecting to builders to do work for. You just have to be there! Linkedin is somewhere you also should be. Their advertising is too expensive for most contractors to partake in, however, posting good content once in a while will result in leads. Create articles and publish photos of your best projects for better results. Houzz is also a good source of leads if what you do is high end. Good photography gets rewarded–however, create your own unique content that you will not use on your own site. Creating a website that converts the right visitors into potential customers is crucial. The moment you decide to start a business, you should get a basic site up. Even if the site is embarrassing, put it up, because it could take many months or even years to make it rank in Google. I was there for the “Wild West” online. You could throw a handful of keywords with some pretty pictures and rank in the search engines for hundreds of keyphrases. At one point I was seeing over a million unique visitors a year on GardenStructure.com. Those days are over. Google displays results differently, SEO practitioners have evolved and there are many thousands of quality sites competing for top-level keywords. This is where Martin Holsinger is on the money. The chances are slim that your website will ever deliver hundreds of leads in a month, so, it’s better to make your website a tool to sell and call your potential customers to action. His personal approach to selling is solid and on trend for 2018. If you want to be seen as professional you have to look the part. Professional looking people in professional looking vehicles is a sign of a good business. We have done dozens of home shows over the years. I can tell you to achieve home show success you need timing, luck and a big investment to make it pay off. When the weather does not cooperate, nobody comes. If your booth is too opulent and not inviting… No leads. When your booth looks amateurish, you get the wrong leads. Home Shows are a lot of work and a big investment to do right, and results are not guaranteed. Keep your powder dry and try that once you are better established. Maybe work with a marketing expert when you design your booth. When I started my business there was no internet or Craigslist. We ran flyers. I can remember working on one block for 3 months. We had 10 clients on one street alone–a good signal that you are not charging enough, but it was the early days of my business. Zoom forward a decade and folks were getting so much junk mail that they rarely read any of it. These days this has all moved online. Nobody is sending direct mail to people’s doors, and walking from house to house with flyers just isn’t done… or is it? Could it be that since nobody is doing it, that this may be an opportunity to differentiate? Inspired marketing will always work. A professional brochure or flyer tied to a well-crafted message will convert to customers. Don’t discount an inspired email message either. Do your research on your customer and personalize it for best results. Email Campaigns spamming thousands of people with junk is a waste of time and effort, not to mention disrespectful to potential clients. Introducing yourself in person to architects, designers and builders is never a waste of time. You are making a personal connection. Since very few are doing it, you stand out. Referral business can provide the best leads. For a handyman service, you could nearly survive on just referrals. As the service gets higher on the spend scale, the percentage of prospects that can actually afford what you do dwindles. This means fewer referrals per project as budgets rise. For new businesses you will be dependent on friends and family for referrals, and, in some cases that can work for you. You will discover though, friends and family often want discounts. Discounts will not leave you with a healthy profit margin. 25 years ago I did a $750,000 project for one of the wealthiest families in Canada. I had designed a little boathouse for their neighbor. He was the President of Scotiabank at the time. The price didn’t matter, it was more than reasonable. He told me that since I worked for his neighbor, he didn’t feel that he could afford me. Maybe I was a rookie salesman at the time, but nothing I said could change that perception. The 15’ high gothic tennis court we built in his backyard told him we were too expensive. That is when I started looking at referrals differently. I decided to retarget my business towards the upper middle class. I had already worked for the wealthiest clients in Canada– and there wasn’t enough of those to build a business on. To discover what marketing fits our business decide who we will market our services to. Let’s face it, you can grow wealthy doing handyman work at $500 a job, or building multi-million dollar houses. Each will require a different strategy and marketing venues. It may take some trial and error to discover how best to connect with your clients. Defining who “Our Customer” is, needs to be your first step to finding the best leads. Once you know who your customers are, it is much easier to find them. Being new to the Protractor Podcast site left me hesitant to respond to any of the numerous podcasts I’ve listened to or the articles I’ve read. I usually “lurk” around a site for sometime before either moving on or getting involved. For whatever reason, I’ve decided to go ahead and jump in. This article intrigues me in many ways, and I see so much which I either already knew through use or simply agreed with in theory. I’ve also encountered some, “Oh, now I see!” moments while reading. Yet there is one thing I think needs a little bit of clarification. Mr. Winterburn writes, “Also, you can have friends and family create reviews for you– your competition already is.” I believe this is true, I’ve used the advice in the past. Yet, what I think needs clarification is what type of reviews your family and friends can and should leave for you. What they must NOT do is make up a review claiming something that didn’t happen. What they can do is say things like, “I’ve known [Mr. Builder] for twelve years and know he is honest and hard working, I trust and recommend him.” Or, “When I saw [Mr. Builder’s] ability to solve a difficult situation, I knew he could be trusted to take care of whatever might come up in a building project.” Anyway, just my bit of clarification to add to this informative post. Hi Yvonne– I cannot disagree. Those that know me know I am honest to a fault. Fictitious reviews are reprehensible– however, I am not so naive to expect that better than half of all reviews online are fiction. A perfect world would be wonderful, wouldn’t it? Yes! I agree. I really sensed, while reading, that you felt the same way. Perhaps because I feel the same way you do about the “fake reviews” I simply wanted to add that tiny bit of clarification. Your article is filled with great advice and I’m looking forward to what more you have to say in your upcoming posts. I despise that reviews are not all pristine– but wouldn’t the world be boring if everyone played by the rules? Thank you for the kind words Yvonne! Working on the next one– I bet you will have comments! It is a bit more controversial.